Sick change-ups to K A-gon. Not to jinx him, but Balester looks good so far. Good lead-off single by Dukes. I'm conflicted tonight. I've made it known that I want the Nats to lose this series, but I have Dukes/Balester/Zimmerman on my fantasy team in the championship game. Plus, I'm okay with getting Green or Ackley after reading about them. Bernadina with an RBI Single! Let him start everyday! Who is on my WNFF fantasy team in our World Series against thom202. Meyer's still in there in the 3rd inning, losing 4-5. So he can STILL get the win. JINX JINX JINX Balester. We need to get swept. Some errors would help. #1 pick! Venable? Seriously? What the hell, Balester? I really wish Bob and Don would shut their freaking mouths. Of course right when they start talking about the Padres' awful lineup, one of their bums goes yard. Bob is such a buffoon with that crap. Annoys the hell out of me. It's like he's just tempting fate and purposely trying to jinx us. He tries to predict crap before it even happens. Just call the game as it happens you donkey. The worst offense is the signature, "THAT'S A DOUBLE PLAY BALL!" Not after you jinx it, dumbass. Awful David Wright just committed like 2 errors on one play that led to 2 runs in the NY-ATL game. Look at how many Anti-David Wright threads there are on the Mets board. He better not win another freaking gold glove. horrible pitches to Giles and Gonzalez. You can't let those guys beat you in this sorry lineup. Too many hanging breaking balls. Don't know why they didn't stay with the change. what the freak? That's embarrassing. He's getting hammered by a bunch of bums. Fastball right down the damn middle. Glad I'm not going for ERA. I hope he's worth the hype. bullcrap. That's not an error on Zimmerman. Unreal. WTF Dukes? 3 straight swings and misses. I like Luke's patience at the plate. Stephen Strasburg: The report outlined a 6-foot-5, 215-pound, 19-year-old from San Diego State with what Lefebvre, a former major league manager, called “the most impressive young arm I’ve seen in a long time.” With a four-seam fastball that regularly touches 100 miles an hour, a nasty slider and a tricky changeup, Strasburg drew a small crowd of baseball connoisseurs to the Torrington Twisters’ tiny stadium. At least 10 major league scouts, with their pitch counters and radar guns in hand, and the United States Olympic team’s general manager, Bob Watson, sat through the damp and chilly night as mist rolled in over the outfield fence. Strasburg made it worth their while. Of the 12 batters he faced in four innings, he struck out 10. Neither of the first two managed to foul off a pitch. As for the two who made solid contact, they flied out to right and grounded to first. ...Playing for San Diego State this season. Strasburg, a San Diego native, went 8-3 with a 1.57 earned run average in 13 games. In 97 1/3 innings, he struck out 133 and allowed just one home run. 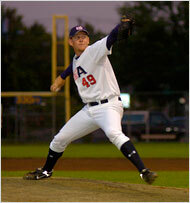 ...Against Utah, Strasburg struck out 23 of the 30 batters he faced. That's not really his choice.